Week 1 – An overview. What are the 7 truths? And if you are new here and haven’t gotten my companion journal to go hand-in-hand with this series, you can subscribe and receive it as my gift to you. It’s a word or a topic we hear frequently these days. It’s also at the heart of much of what I write about. Like here and here. I believe it is important because our identity is who we are. And who we are is revealed in how we live our lives. It’s about our dreams, our passions, and the fulfilling of our purpose. My personal story of identity is less than stellar. I was clueless. A young and impressionable girl grabbing her identity from the world around her, rather than the God within her. Betrayal oozes with lies. Every. Single. Time. The enemy rejoices in it and works heartily at ensuring we clothe ourselves in the titles insinuated by the offender so that we ultimately identify as a victim. Because as a victim we will not fulfill our purpose. And as a victim we will not see victory. But, my sweet friends, betrayal is not our identity. I get it. I get the hurt. I get the lies the enemy whispers. I hear them, too. But listen to this truth – People do not betray based upon the worth of those they betray. They choose to betray because of a brokenness deep inside themselves. An unredeemed sin in their hearts is acting out the betrayal. We need only look at the example of Judas. His betrayal obviously wasn’t based upon the worth of Jesus. It birthed out of his own sin. Sin may fling daggers of ugliness our way, but as a child of God, being a victim is not our story. You see, believing in Jesus isn’t just about a ticket to Heaven. It’s also about the victory we have right here on earth right now. 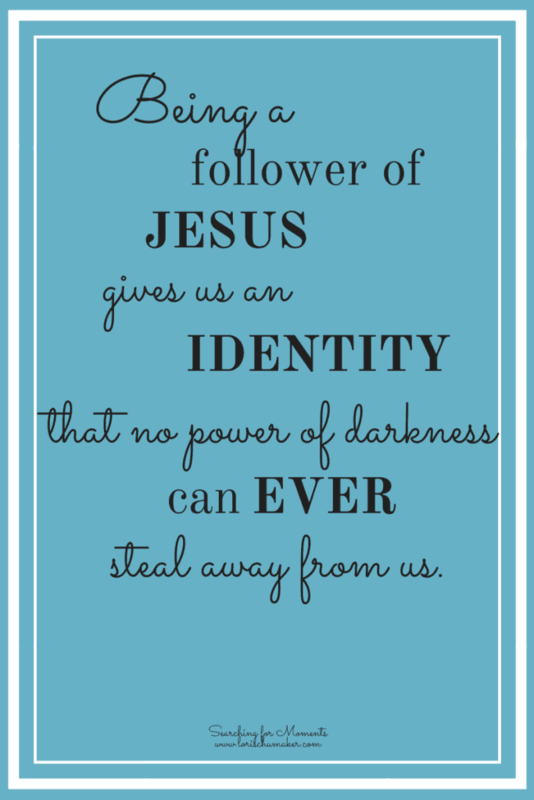 Being a follower of Jesus gives us an identity that no power of darkness can ever steal from us. It was truth that gave me goosebumps, you guys! Because if we were rescued for the world, there is no way Jesus rescued us to live life encumbered by the title of victim. The injured? The betrayed? The broken? Stuck in the muddy pit of the betrayer’s sin? Wearing their sin on my back as my label? I am a victor because my identity is in King Jesus. He trumps all other sin. He washes the label of victim off me and replaces it with one that no one can take away. He labels me as VICTORIOUS. The other night I had the opportunity to listen to Jamie Winship speak. He spoke about abiding in Jesus in a way that had never before registered in my soul. Abiding is what we need to do in the face of betrayal. We rest in the warm and loving, but safe and fierce protection of the One True King. There we find a supernatural peace that rises above all else in the world. There the betrayal has no sting. There you rise from victim to victor. Friends, rewrite the lies when you hear them. Filter them through the title of Victor and the truth of Jesus. Live them and give testimony to them. God will use your story to usher victory in for another. Subscribe and get the companion journal written specifically for this series! If you are new here, all you need to do is subscribe right below or on the sidebar. Upon confirmation, the e-book will be delivered to you. You can choose to read online or print at your leisure. For those of you who have already been a loyal member of my community, please just email me and I will forward a copy of the book to you! Plus, get 7 Originally Designed Printable Thank You Cards! I love this, and I love that we are neighbors over at Laura’s today and we’re both talking about identity! God is pretty smart like that! Great post – full of great truth! Hi Karrilee! I am so glad we were neighbors, too! He sure is smart 🙂 Thank you so much for your kind words! This is beautiful, Lori! God has given me the verse Isaiah 61:3 at several key times in my life. My story is not one of betrayal, but one of loss of loved ones. No matter what our story is, He gives beauty for ashes — every time. Thank you for sharing these gems of wisdom with us! Willena, Such a beautiful verse. I love how God plants certain ones in our hearts to hold close as part of our armor!My heart is with you and I am so very thankful that your testimony is a powerful one of beauty for ashes! Thank you so much for visiting! Thank you so much! I invite you to come back and visit again! I am so thankful God used these words for His good!Thank you for your kind words! Lori – visiting from Coffee for your Heart…Thank you for sharing your beautiful words of truth! Thank you for visiting and thank you for your words of encouragement! I hope to connect more in the future! Lori, I love, love, love this! I don’t have to be a victim because of Jesus. “Believing in Jesus isn’t just about a ticket to Heaven. It’s also about the victory we have right here on earth right now. Being a follower of Jesus gives us an identity that no power of darkness can ever steal from us.” I love this so much, I had to share it on FB. Thank you for this encouragement and for linking up with Thankful Thursdays. You are such a treasure! I am so thankful for you … And I am thankful God used these words to point to Him and give encouragement!! Thank you so much for hosting! I would love to join you again! Hi Lori, I am glad you continued this series. Waiting for what is next! You are so right. We don’t need to carry the betrayals sin on our backs. It doesn’t have to be our label. Thank you for the encouragement, Ifeoma! I am so glad you are a part of this community! Hi Dolly, I am so thankful you were convicted of truth! I am praying and claiming that grace in you to fully claim your identity in Christ- as wonderful, priceless, and treasured child of the King of the Universe!! I love this! I labeled myself a victim for more years than I’d care to count and I literally made it my identity because I didn’t know the Bible and the truths found inside. So grateful that I’ve broken free from the lies. Wonderful post! Thank you, Carrie! Amen! I am praising God with you for breaking free from the lies! I am so glad you stopped by and shared a bit of your story. I so love that you have victory in Him and through your writing, you point to Him everyday! I love this post — we are victors, not victims! I found your post on Social Butterfly tonight, and I “liked” you on FB. I am so glad you found truth here, Melanie! Thank you so much for stopping by and for the FB like! Jenny, I absolutely love stopping by your blog each week. I truly do. There is something so sweet, refreshing and real that makes me smile! You are a treasure! I remember standing in the wings of a huge Easter production watching the crucifixion scene when it fully sunk in that Jesus knows rejection and betrayal far better than we could ever imagine. It reminded me that he fully sympathizes with our weaknesses and offers to take them from us and give us His peace. thanks for this encouraging post! What a beautiful service that must have been! And, yes, yes, yes – it is so difficult to wrap our heads around the fact that He knows rejection and betrayal so well! I’m so glad you found encouragement here! I hope to see you visit again! I am so thankful God gave you a tender message through this post. Thank you so much for visiting! Get this e-book Companion Journal to walk you through 7 areas of healing from betrayal. Plus, have full access to all resources in the Library of Hope!